Citing security situation, IDF announces closure of crossings to Gaza Strip, Judea and Samaria during Passover festival. An IDF spokesperson has announced that it will impose a general closure on the Gaza Strip, Judea, and Samaria during the upcoming Passover festival. 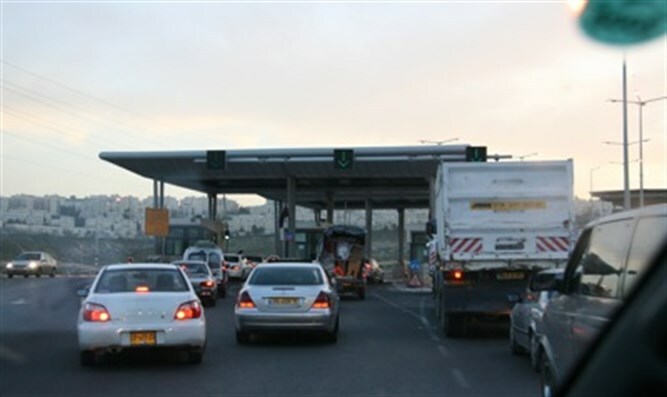 All crossings into pre-1967 Israel will be closed to Palestinian Authority residents and residents of the Hamas-ruled Gaza Strip beginning at 11:59 p.m. Thursday, March 29th. The crossings will be reopened on April 7th. The decision to impose the closure was made in light of the current security situation, the IDF said. On Tuesday, three Arab terrorists armed with grenades and knives infiltrated into Israel from the Gaza Strip, with the intention of murdering Israeli security personnel. Emergency passage for humanitarian needs will still be permitted during the closure. Earlier this month, an Arab terrorist ran down and killed two Israeli soldiers in northern Samaria, and injured two more. The murdered soldiers were identified as Captain Ziv Deus, 21, from the Azor Regional Council, and Sergeant Netanal Kahalani, 20, from the town of Eliakim. Days later, a third Israeli was murdered in a stabbing attack, when 28-year-old Abed al-Rahman Bani Fa’adal, a resident of the Palestinian Authority-controlled town of Aqraba, repeatedly stabbed 32-year-old Adiel Kolman, a father of four from the town of Kochav Hashahar.